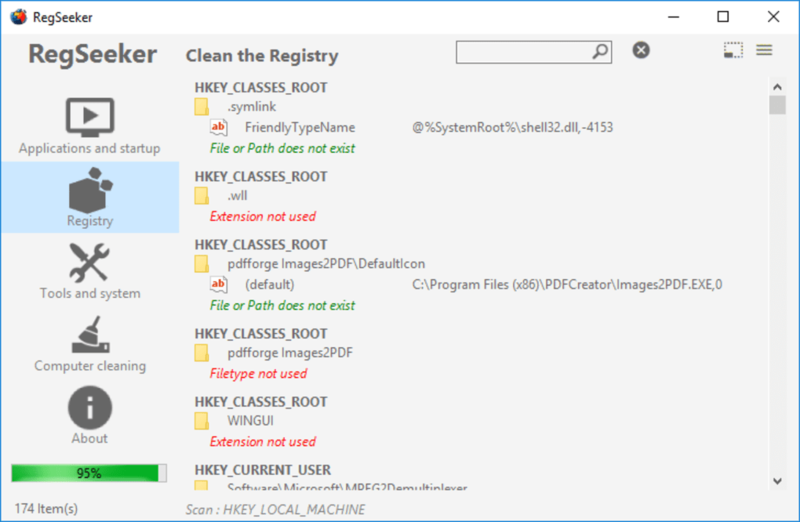 Every computer generates a Windows Registry that contains low-level settings. Everything operating in a computer access the Windows Registry. This includes system information, user settings, user options, and every recorded data that indicates every installed component on all the OS versions. A new subkey is generated when a freshly installed program is integrated into a system. The system OS and applications usually access the registry so that everything runs smoothly and constantly. 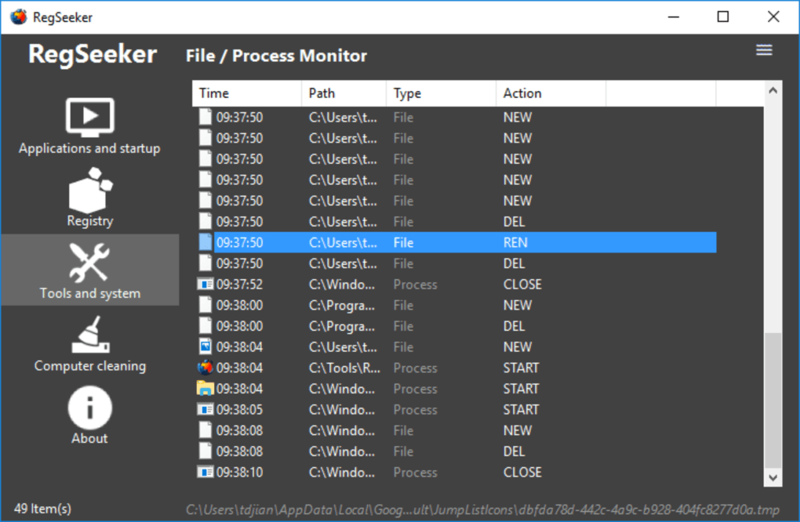 The common applications that utilize the Windows Registry are the kernel programs, drivers from integrated devices, Windows services, Security Accounts Manager, and the default user interface. 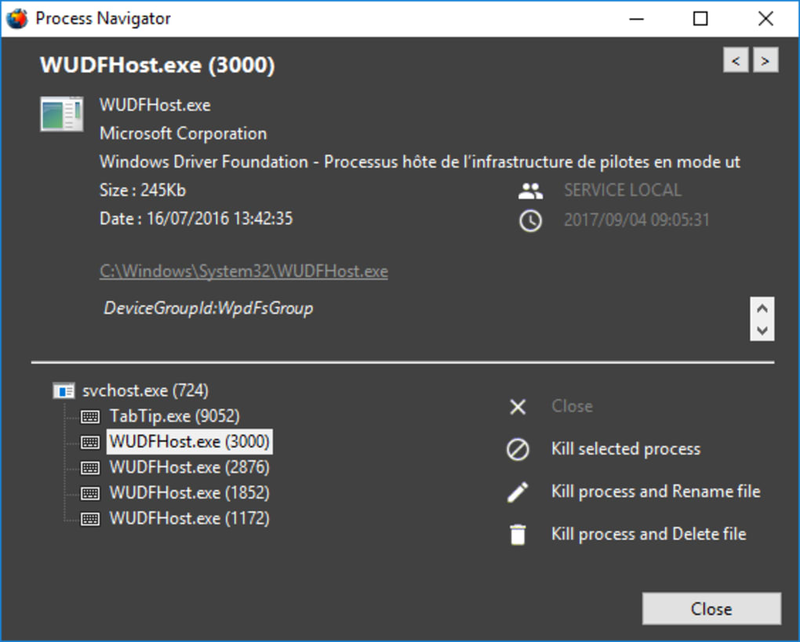 On the other hand, the Windows Registry grants access to instrumentation counters so that it can profile the performance of the computer. Some I.T. personnel consults the Windows Registry whenever an anomaly occurs on the computer and normal means of scanning can’t detect it. When a system receives constant updates, more and more Windows Registry pile up until they lose their value since they become outdated. RegSeeker has intuitive interface and tools to make cleaning less of a hassle for Windows XP to Windows 10. A single press is only required for automatic cleaning and maintenance. The software allows searching for anything in the system registry, They can browse, create, delete, export, monitor, search or rename all items found, as well as scan invalid entries that could have been clogging the computer. 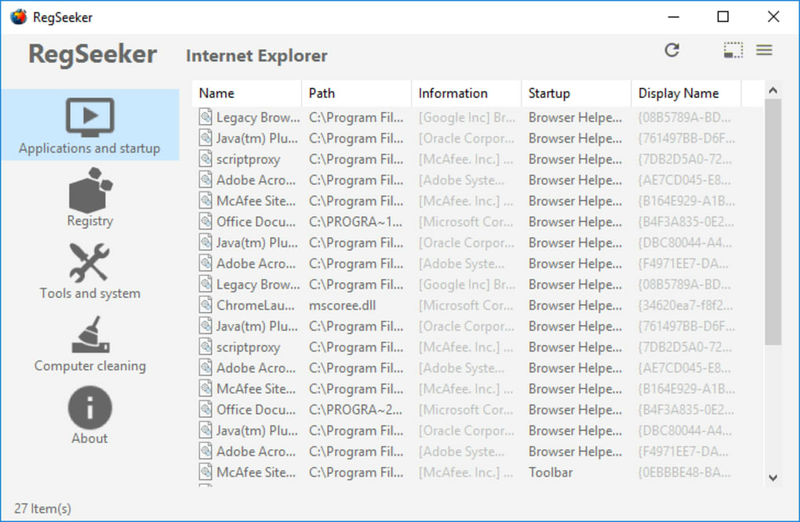 Items like active processes, application document histories, and settings, browser caches, Chrome Extensions, Internet Explorer add-ons, services, start menu entries, old files and registry entries are available for managing. Activities with the software are displayed on the system information panel. The system services can have their startup type edited. This software includes a script engine for writing commands and assigning tasks automatically. Any broken startup entries can be repaired and set again. Users can have their own Regedit bookmark where they can assign favorite settings. 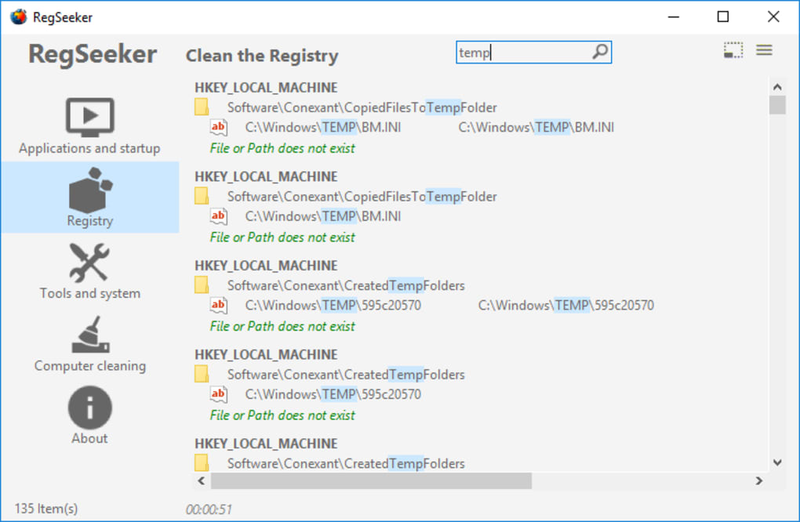 They can access their most favored registry entries with the Regedit bookmark. 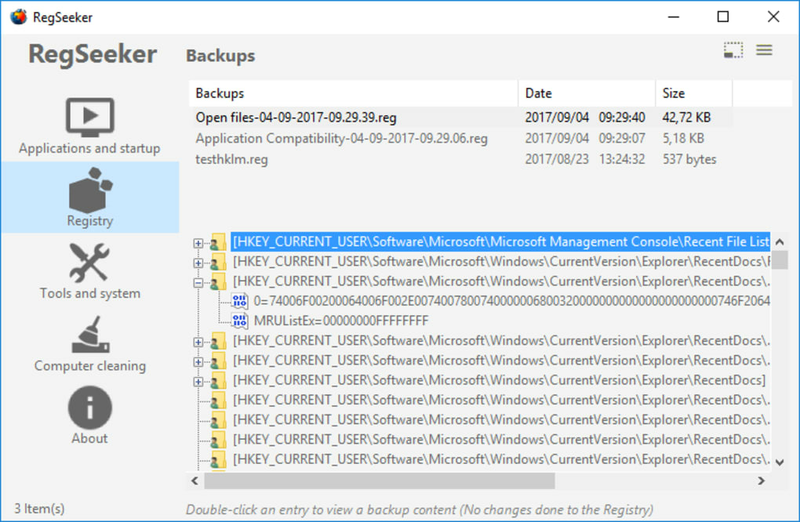 The software has the Backup manager so that registries are secured during system updates and can be later retrieved. The software also includes a theme customization so that it can fit with any type of desktop settings. More features like Deep Cleaning, Optimal Process Management, exporting of File and Process Monitor lists, auto repair registries, advanced Systems Information list, drivers backup tool, and advanced scripting commands are available at the Advanced version. RegSeeker allows users with minimal knowledge of doing I.T. tasks to improve their systems without the struggle of harming important files. 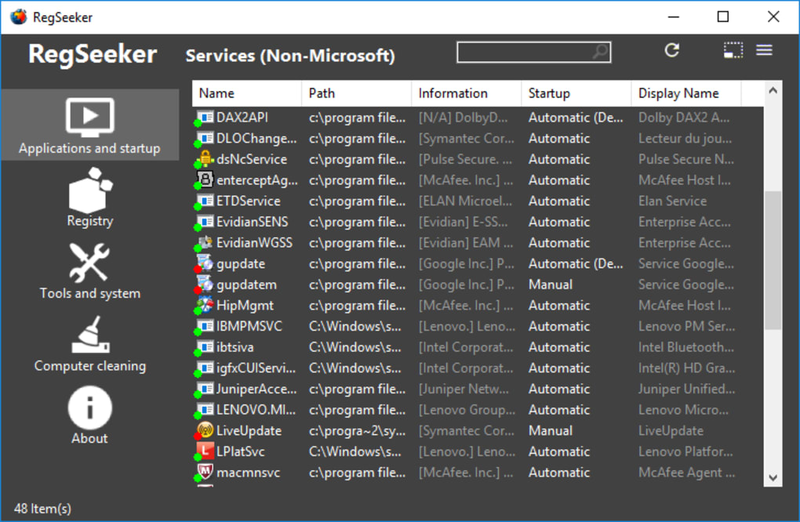 It does a cleanup of Windows Registries that have been stuck on systems and no longer usable. 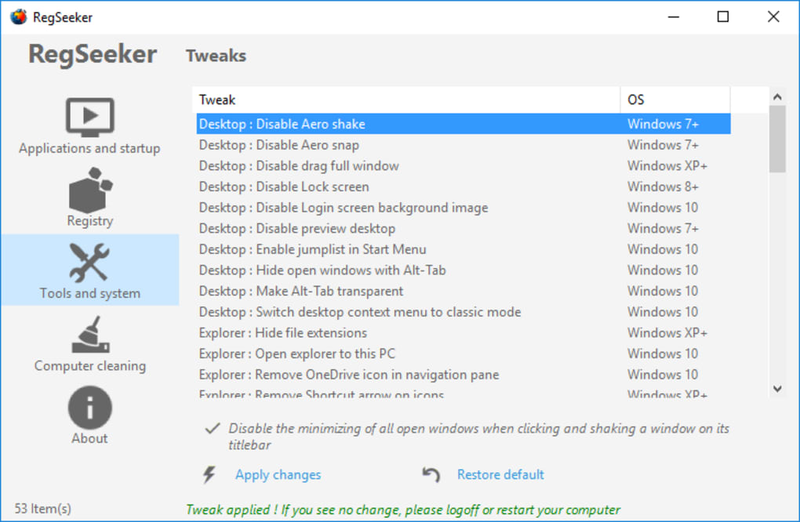 RegSeeker is the all-in-one toolbox for your Windows. It includes a powerful registry search and cleaner tool. 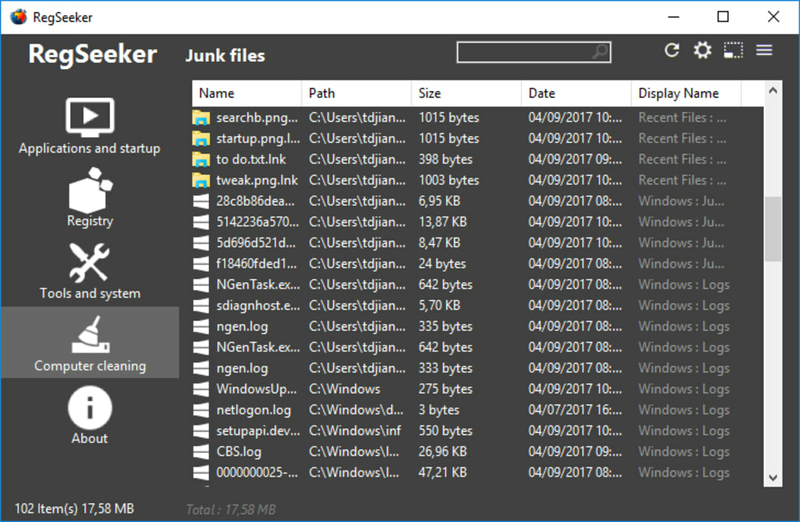 RegSeeker is the all-in-one toolbox for your Windows. It includes a powerful registry search and cleaner tool. 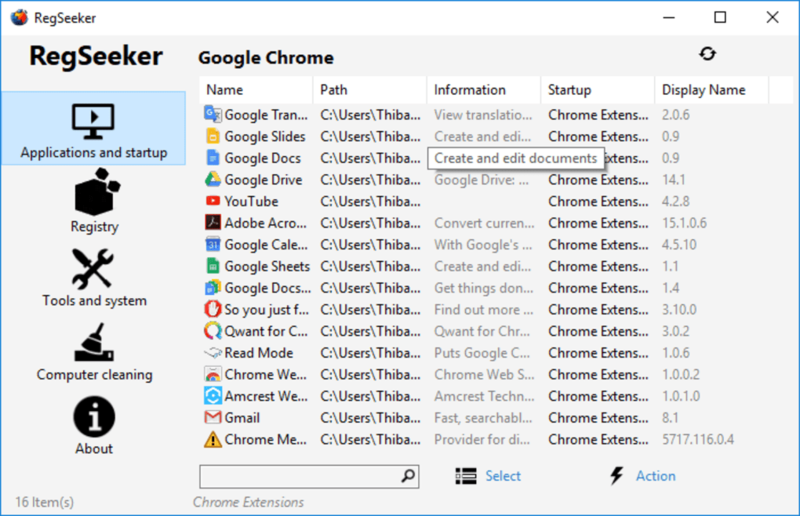 Take full control of your startup entries, services, drivers, histories, junk files (protect your privacy), installed applications, browsers extensions, and more ! With RegSeeker you'll exactly know what is installed and running on your PC. All-in one toolbox for your windows to view everything running, installed on your PC. 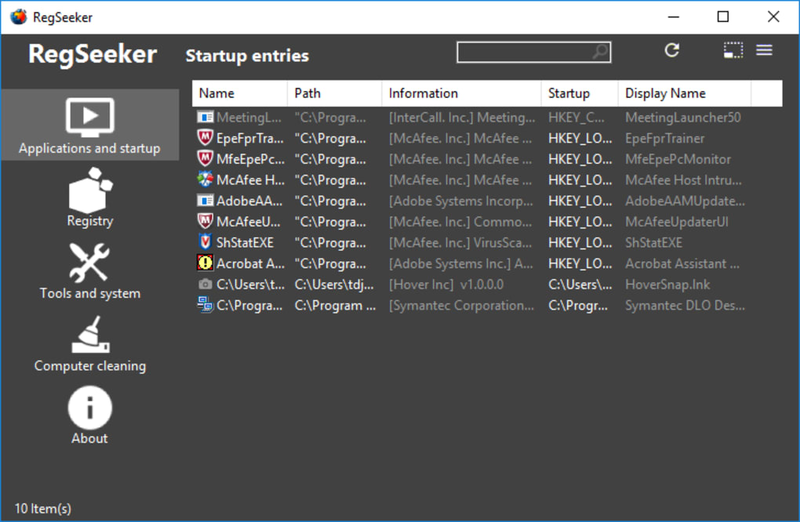 Safe, protect your privacy.Take full control of your startup entries, services, drivers, histories, junk files (protect your privacy), installed applications, browsers extensions, and more ! With RegSeeker you'll exactly know what is installed and running on your PC. Scan only, does not fix anything.. Does NOT work. I ran a registry scan and told the program to fix. After the fix, I rebooted my pc and ran RegSeeker again and got exactly the same errors I had BEFORE it supposedly fixed them. It is fine if you want to find specific entries in your registry, but does not fix anything. The best I have found... after trying twenty other ones.... But it seems that you have to know what you are doing. Do not over clean the registry. Detected &quot;problems&quot; are evaluated in three main categories. Green=&quot;safe to delete&quot; brown and red=&quot;watch what you do&quot;. In fact even if you do do mistakes you may correct it easily. Not for newbies. You can really do what is needed. Very Powerful but not intuitive. 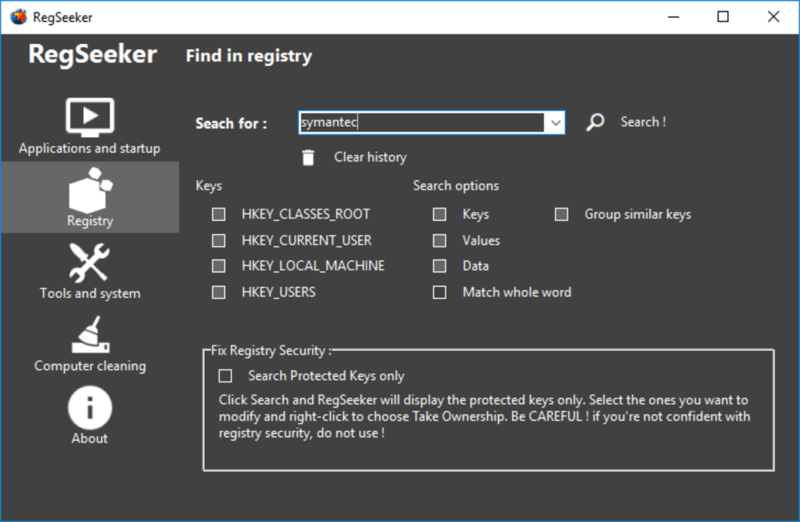 After cleaning the registry with another program, I was able to find over 1500 errors in the registry through Regseeker. Very Powerful Registry Cleaner. RegSeeker is a very powerful and easy to use registry cleaner. Everything is just a click away. It find more registry errors than most other free products and does it rather quickly. It's also portable so you can take it anywhere. But RegSeeker is only meant for advances users, if you don't know what your doing it can erase valuable files your operating system needs to function. The downside to using RegSeeker is it is so powerful it can remove needed Operating System files. It can also freeze your computer from time to time while scanning and removing errors. 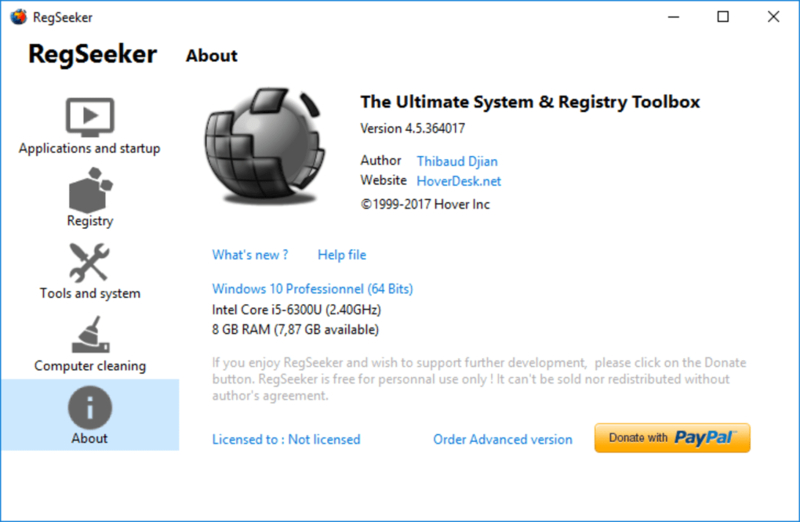 There also hasn't been a new version of RegSeeker for years, and it is not officially compatible with Windows 7. 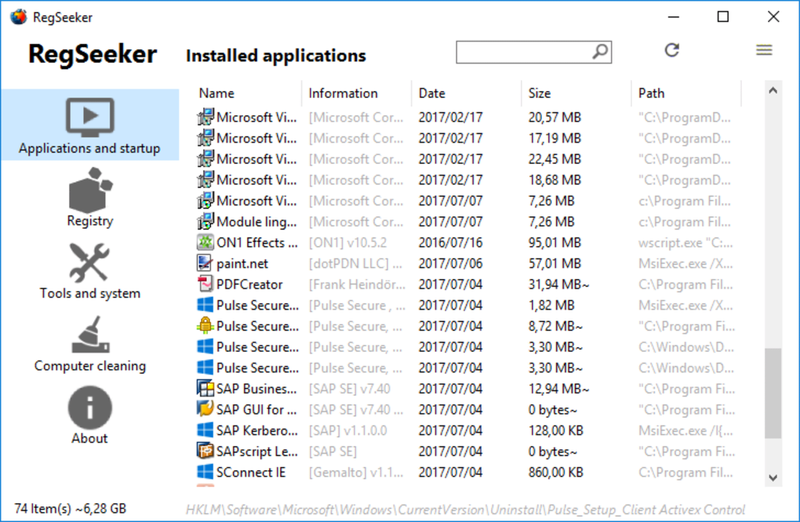 All in all if you use XP still and know what your doing then RegSeeker is a great tool for it's high detection of errors and easy to use interface. However the average user should avoid this product as it can make your operating unusable and could require you to reformat your computer or pay to have it fixed. No New Version Has Been Developed In years. No Official Windows 7 Version. Can Make Operating Systems Not Function Right. Not the Best. Well, I was a little frightened when it gave me several warnings about ruining my system when i scan my registry not to mention the program doesn't even install so i couldn't use my safe uninstall software, rather i had to just delete the files. When i scanned it gave around 1000 problems and i erased them all. I scanned again about two seconds after that and it gave me 1000 problems again. I have no idea how this software works but i know its no the one for me. When i checked my Desktop maestro after having removed over 2000 registry problems it had actually only removed around 40. If you want my opinion, don't download this software. I've tried most registry software and there are better ones. I'd go with Desktop Maestro or Registry Mechanic if i got a choice. What do you think about RegSeeker? Do you recommend it? Why?